What can we learn from verse 1 about the spirit of the people? Why was it important for them to be unified in the work (gathered together as one man)? Are you on any team in which unity is important? Why? What are some of the most common causes for disunity then and now? What is the first thing they did after gathering at Jerusalem? Why do you think they set up the altar so soon after returning? Where did they set the altar? Why were they so scared of the people and what is the relationship between this fear and their setting up of the altar? Besides setting up the altar and beginning daily sacrifices what else did they do? What do all of these things show about the people’s heart and relationship to God? Do you remember the reason why they were exiled in the first place (discipline for sin)? Based on this passage in Ezra 3, have they learned their lesson? What can we learn from this about how we should respond when we are disciplined by God? Colossians 3:14 – Put on live which binds all together in perfect unity. Ephesians 4:3 – Eager to maintain the spirit of unity in the bond of peace. Psalm 56:3-4 – When I am afraid I put my trust in you…What can man do to me? Psalm 23:4 – Even if I walk through the valley of the shadow of death I will fear no evil. 1. The people gathered together as one man to Jerusalem. This shows a very real sense of unity among the 42,000 plus people who returned to the land. It appears that every single person showed up. They arrived with a common purpose, not each with his own motivations. From my experience, it is hard to get two or three people together with this complete unity, much less over 40,000. It was important for them to be unified especially because of their circumstances. Jerusalem was a mess. There was no wall. Most of the structures were decayed and destroyed in the seventy years since the people were exiled. There was no temple or altar. As we will see in the next chapter, the people of the lands around them hated them and sought every chance to destroy and distract them. In some movies you might see scenes where two enemies face the same imminent danger. If they don’t work together both of them will be destroyed. This is a similar case. The people of Israel had to learn to put aside their petty differences and work together or their very existence as a nation would be in jeopardy. This was not like their last entrance into the Promised Land. The first time they were 2 million strong. They had a powerful army of 600,000 warriors. The people of the lands were terrified of them. This time the situation is somewhat reversed. They are the “weakling” surrounded by nations more powerful than themselves. Unity was essential. 2. Yet in many cases, even though unity is essential, people are not able to unite. Why do you think the people could unite in this case? 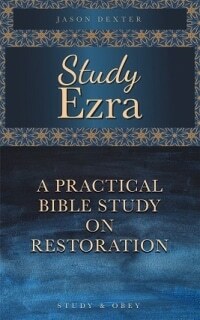 We learned back in Ezra 1:5 that it was God who stirred them to return. God was in charge of this movement back to the land. They were surrendering to God’s leadership and depending on Him. Where unity is impossible to achieve on our own, God can give it. a) Application and Discussion: Is there any area where you are struggling with unity? What do you think God wants you to do about it? What have you found to be some of the top reasons for disunity? 3. The very first thing the people did as a group was to rebuild the altar and re-establish the daily sacrifices. This could have been low on their list. There were certainly many other pressing things they needed to do. They needed to rebuild their houses. They needed to re-till the soil for their farms. They needed to plant crops for their own sustenance. They needed to rebuild the city wall. The list goes on and on. But it doesn’t appear that they did those things or at least they probably didn’t finish them (for example we know they didn’t finish the wall). The people were faithful to put God first. They wanted to start off on the right foot after their return to the land. This meant making God the priority and trusting that God would keep His promises for them (ie: Jeremiah 29:11) and take care of their needs, which were many. a) Application: What application can we learn from this? Is there anything you need to do to put God first in your life? Or are you taking care of yourself first and then giving God the leftovers? 4. The people were terrified of the people in the land. This is a very natural reaction. The returned nation was very fragile and vulnerable. They were not able to defend themselves well. What did do because of their fear? It seems that this fear was part of the driving force that motivated them to build the altar. In other words, their fear of the surrounding peoples, drove them to God and to seek God’s blessing and protection. Is fear acceptable? Fear itself is a natural reaction to some dangerous situations. We can have two responses to fear. We can let fear paralyze us and keep us from doing what we should do. In the Israelite’s case that would have meant running away or huddling up together in their houses. Or we can confess that we do feel afraid and turn to God for help. Psalms 56:3-4. This appears to be what they did. If you see a person in a flood who is drowning, it would be natural to be afraid of jumping in to save that person. We can allow our fear to keep us from helping the person or we can say a quick prayer and leap in. a) Application: Is there any situation that you are afraid of? What is the root cause for this fear? How does God want you to deal with it? 5. In addition to building the altar and sacrificing the burnt offerings, the people also celebrated the Feast of Booths. From our study in Exodus, do you remember what this was? For centuries even stout believers often stopped short of keeping all of the prescribed festivals. For whatever reasons, this national gathering to celebrate God’s providence in their history was rarely gathered. But this group of people clearly determined to follow all of the law, even those parts that weren’t extremely convenient. They wanted to get off to a good start in the land by faithfully obeying the laws that Moses had passed on from God. a) Application: Are you perhaps picking and choosing which laws to obey as many Israelites in their history had done? Do you obey when it is convenient or are you determined to obey everything God has commanded? Which of God’s commands are the most difficult for you to keep? 6. My impression from this passage is that the people repented. God disciplined them by exiling them for 70 years. This discipline was meant to bring them back to God again by showing them that sin had consequences. At least for the time being, they got the message and were determined not to repeat the same mistakes their ancestors had. We must also respond properly to discipline. Do not grow bitter because of discipline. Instead accept it, repent, and move on. What did the people start doing the next time they gathered together? Who helped with this task? Do you think everyone did the same thing? What different tasks would have been necessary? What principle can we learn from this? What do we learn about the team in verse 9 (unity)? What were the leaders doing (overseeing)? What is involved in this? After they finished the foundations, what did they do? Why? What can we learn from this about our attitude toward God? Who got the credit for their successes and accomplishments? Why were some of the people sad? Is there any lesson we can learn from the fact that the second temple was not nearly as beautiful/awesome as the first one? Psalm 100:2 – Serve the Lord with gladness. Come into His presence with singing. Colossians 3:16 – Singing psalms and hymns and spiritual songs. 1. The next project was to rebuild the entire temple, not just the altar. The people wanted to finish what they started. This project was actually much more difficult, but they intended to do it. This once again shows their heart as they desired to serve God fully. 2. One phrase strikes me from verse 8. That is “and all who came from captivity in Jerusalem.” Everyone was taking part in this. Certainly many of them did not have elite skills for building. But there was something everyone could do. Maybe it meant cooking for the workers. Maybe it meant gathering food for the people. Maybe it meant carrying equipment or materials from one place to another. Maybe it meant hauling water for the animals or cleaning up after the animals. There were many tasks and everyone jumped in to do what they could to help. 3. We see from verse 9 two points. Firstly, the leaders who were in charge of the project were unified. This carries on from the first half of chapter 3. Unity is essential when any large group of people gather together to carry out a difficult project. Secondly, they were overseeing the workmen. The leaders did not do all of the work, but they supervised the process. That likely meant delegating jobs, finding out who was good at what, assigning people to smaller teams, and making an overall plan. a) Application: This situation is similar to that of the church. A church is also a large group of people. In this group there are many skills/gifts. There are also many ideas. There are some leaders who can oversee. But there are also many tasks to accomplish the mission (building up the body and carrying out the great commission). There is something everyone can do and each person’s gift is useful and important. Leaders should strive to motivate those God has called them to serve to take part. Those who attend should not just be observers, but should jump in to volunteer to help. 4. After finishing the first stage of the project (foundations), the people stopped to praise and worship God. They didn’t become prideful in their accomplishments. Instead they gave all the credit and glory for their restoration to the land and the restoration of the temple to the Lord, where it belonged. They were thankful that after 70 long years God had fulfilled His promises to them. He brought them back safe and sound. He gave them favor in the eyes of Cyrus. He gave them unity and enabled them to begin rebuilding the temple. Indeed, God was faithful to them and deserved all of their praise and worship. Read cross-references and discuss. a) Application: Is there anything you would like to thank God for? Is there anything you want to praise God for? As believers, we should have a habit of telling others what we are thankful for and praising God to one another. 5. While most of the people were joyful because the temple was being rebuilt, there were a few who felt a bit differently. These were the very elderly who had as children had seen the original temple. In contrast, the new one was pitiful. To them, this offered a clear contrast which showed them just how far the nation of Judah had fallen. Although God had forgiven them and restored them, the position they were restored to was not as high as the position they had before. This truth struck their hearts and likely reminded the people why this had happened. It happened because of their sin. We too should remember that while God is a forgiving God, sin has consequences. Conclusion: In this chapter, the people are excited. They are united. They are working together in harmony. Faithful to God, they strive with all their hearts to keep all of His commands and worship Him fully. Everything is going smoothly and according to plan. Yet this is just the time that Satan wants to attack and get us off track. See the next chapter to read about the practical difficulties the people will begin to face as they seek to follow the Lord. For our closing prayer today, let us each one offer praise and thanks to God for the things He is doing in our life.